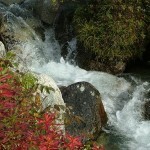 We offer a visual feast with our Alaska vacation packages. Our 6-13 day escorted small group tours of Alaska’s most wonderful sites take visitors into the wild through our fun-filled adventures featuring National Parks, penetratingly blue glaciers and unbelievable wildlife encounters. Salmon float under swirling waters, grizzlies wait in silence. Relaxation, deep clean breaths, experience the “Alaska” you have only read about! 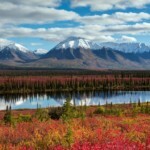 Our activity-driven itineraries and majestic beauty are all a part of our Alaska vacation packages. Rugged luxury geared towards families, individuals or small groups, we cater to every skill level and tailor for flexibility! Reds, Golds & White Capped Mtns. 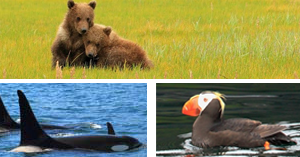 Compare the highlights of our Alaska vacation packages listed with our tour comparison chart. If you’re interested in custom Alaska vacation packages for a group of 6 or more, find out more at our Friends & Family Groups page. We also offer self-drive or rail tours on our Self-Drive Tours page. Whatever your need, we can help you discover Alaska without the tourist traps!